Anyone familiar with Mop Mop already knows that their refined sound places them in a unique position somewhere between the worlds of jazz, funk, latin and Italian Postmodern style, which allowed the band to achieve International film business as part of Woody Allen’s “To Rome With Love” movie soundtrack. But with this latest LP “Isle Of Magic”, Mop Mop digs even deeper to bring us one of their most engaging and organic records yet. Mop Mop‘s fourth studio album has come together over the course of a couple of years where producer Andrea Benini has been searching for new directions with the band. Collaborations in the album include Funk legend Fred Wesley, Trinidad-born poet/singer Anthony Joseph and Finnish-Egyptian vocalist Sara Sayed. Over fifteen musicians were involved during the production of the album including Andrea Benini s co-arranger Alex Trebo on piano, Pasquale Mirra on vibraphone and marimba, Guglielmo Pagnozzi on clarinette and flute, Johannes Schleiermacher (Bajka, Radio Citizen, Woima Collective) on baritone sax, Lorenzo Ternelli and Salvatore Lauriola on bass and Danilo Mineo on percussions — just to name a few. 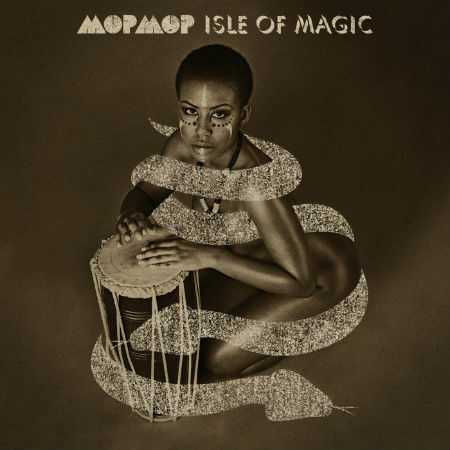 “Isle Of Magic” contains 13 tracks of pure Voodoo Jazz, Caribbean flavours, Afro-Funk, Exotic rhythms and Soul music. The album has been recorded between Germany and Italy with the use of vintage analog equipment to achieve a sound with all the warm qualities of vintage analog tape recordings; sessions have been recorded during the period March/August 2011. “Isle Of Magic” is an imaginary land populated by musicians who spend their time fishing, cooking, playing and practicing Voodoo rites at night. The whole album represents the soundtrack of this imaginary life.